Do you harbour treasured childhood memories of sitting around the Monopoly board, buying up properties and reducing friends and relatives to penury? Perhaps you’re passing this tradition down, teaching your own kids the vicarious joy of ruthless capitalism. But did you ever ponder the history of this popular pastime? I found reading the story of its creation is almost as exciting as playing it. 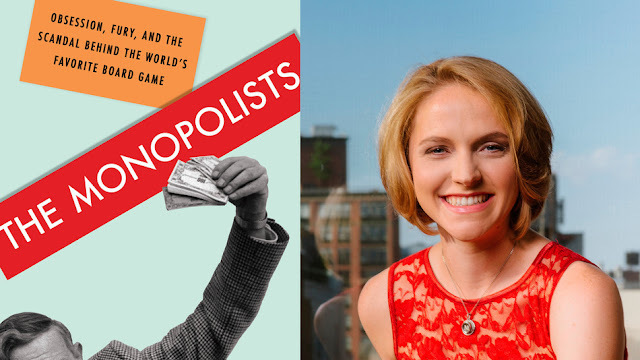 This hidden history is recounted in the new book “The Monopolists: Obsession, Fury, and the Scandal Behind the World’s Favorite Board Game” by Wall Street Journal and New York Times reporter Mary Pilon, one of Forbes’ 30 Under 30. I picked it up on Sunday and could barely put it down until I had reached the surprising conclusion. Who knew the story of Monopoly featured so many fascinating characters, idea theft, political propaganda, and most of all, the monopolistic machinations of a game company desperate to protect a trademark they don’t rightfully own in a David-and-Goliath court battle versus a principled professor? One of the key revelations is that Monopoly was designed to be educational, as well as fun, teaching people the built-in unfairness of our current economic system. Imagine life as a big, ongoing Monopoly game. At least in the table-top version, everyone starts equal, with the same stash and chance to buy and build on properties while passing Go and collecting income. Although luck plays a major role, truly anyone can win. Now imagine joining the game in progress: most of the properties already bought up, built on, and renting at high prices. For even a chance at success, you must struggle to earn or borrow enough money to buy your way onto the board, before the rent you must pay each turn eats away your savings. How fair would that be? Yet that’s the world we live in, where some are born into great land holdings and others start the game with nothing, and little chance of changing their fortune on an uneven playing field. The original Landlords’ Game was invented at the turn of the 20th century by feminist Lizzie Magie to illustrate, through play, the principles of wealth accumulation introduced decades earlier by pioneering Progressive economist Henry George in “Progress and Poverty” and his other popular books. Although featuring many elements of the modern Monopoly game, it was not mass-produced and instead developed into something played in select progressive communities using home-made boards and tokens. Eventually, as it was passed and copied from family to family and table to table, it evolved into the game we now recognize, which was sold to Parker Brothers by a man who falsely claimed to have invented it in 1935, the beginning of a long history of misrepresentation and corporate bullying going as high as the Supreme Court. So pick up a copy of The Monopolists and learn things like why one of the most lucrative properties is named after Atlantic City’s prohibition-era gay district, how the Quaker religion influenced aspects of the game (and the city where it is set), and the game-winning advice of a Cornell University student and president named Jeff Lehman. Discover the connections to Abraham Lincoln, and Franklin Roosevelt’s Brain Trust. Then break out the board and race to be the first to build hotels and dominate your playmates! Published as my Root Issues column in the Barrie Examiner as "Fascinating story behind popular board-game [sic]"
Climatologists vs. "Skeptics" - guess who wins?